Use the claw once and you’ll wonder how you ever detailed without it! The Claw LED Auto Detailing Light is ingeniously designed, and here’s why: this light is able to hook, hang, or magnetically attach to virtually any automotive surface. The spring loaded “gripper” makes it possible to hang the light inside your interior to provide more than adequate illumination for vacuuming, cleaning upholstery, etc. The light also features magnets that allow it to be used for under hood detailing or mechanical work. Trust us when we say you’ll love this light! The CLAW LED Auto Detailing Light features a two-stage switch for high/low illumination. The bulbs are LED which means the light will provide years of trouble-free illumination for all your detailing needs. The battery is rechargeable and includes both an AC and DC charger! 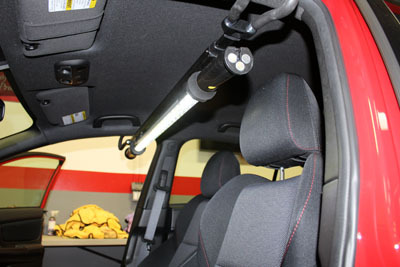 The Claw LED Auto Detailing Light can be detached from the holder for even more applications! When the light is attached to the cradle, it can rotate 360 degrees for optimal visibility in any detailing situation. We’ve all struggled with sub-par lighting while detailing an interior or engine compartment. Lighten up your day with The Claw LED Auto Detailing Light! • Length: 48" - 77"
I just used "The Claw" (love the name!) for the first time inside a Jeep Wrangler. It fit perfectly stretched across the top frame bars in the rear, and the top itself in the front. The claws are well padded and grip well. The light is adequate on low for most jobs, and on high lights up the interior like daylight. I found the ability to rotate the light in the holder very useful. Unlike some reviewers, I thought the light was well made with high quality materials, although it was more bulky and heavy than I expected. I also was disappointed the light shut off after only 1.5 hours using a combination of low and high settings. Not being able to plug the charger in while using the light is a major flaw in my opinion. Overall I'm satisfied, and even with it's shortcomings would buy it again. The design and function are excellent. My only concern is longevity. The light housing, hooks in handle, frame etc do not feel sturdy so I'll reserve judgement on longevity. Otherwise the design and function are excellent. ProsExcellent idea for a light, well designed. ConsLight housing and materials feel low quality and fragile. I have used this twice now and really like it. It can be angled to through light in just the right place.